We love all of our brides at OUTW! Heather heads a special place in our hearts as we have known her for several years & been able to watch her grow up and mature in the beautiful woman she is today. So we were so excited when she came to OUTW to find her gown. She came in hoping to find a beautiful experience, unsure if she would purchase that day and she left with a beautiful gown + an equally beautiful grin! Let's journey together through her appointment where Heather said YES to the Dress!! My mom, sisters and Sharon. Sharon convinced me to try on the dress that became my dress. Nothing at all like I had in mind, this dress totally exceeded my vision! It was perfect! Sharon made me feel welcome, wanted to know all about Jamie, how long we had been together, how he proposed, when our wedding was, what I was looking for in a dress. She sat down with me and asked to see pictures of what I was thinking, she asked my mom and sisters what they wanted to see me in. I had it in my mind I did not want a ball gown because it was too much dress. Sharon brought me a few options and let me pick what to try on. She convinced me to try on the ball gown which I was avoiding. It was the last dress I tried on, she said that I could custom my dress and take away some of the skirt and change the top. I really wanted lace on the top of my dress, Sharon showed me some options of different options. I picked out the one I wanted and then the skirt. I ended up going with the ball gown. I loved it without all the skirt! I was the last one to realize that it was my dress. My mom was the first one as she got teary, then my sisters, then me. I loved my dress and going to Once Upon a Time Weddings. It was the third store I went too and I was super nervous I had a feeling that my dress would be there and that I would find my dress. I would recommend Once Upon a Time Weddings to anyone looking for a wedding dress, bridesmaid dress or even a mother of the bride/groom dress. It was such a great experience, and made me feel special. I was hoping for the experience I had seen on TV and it was so much better! Thank you for helping me find my dress it was beautiful! 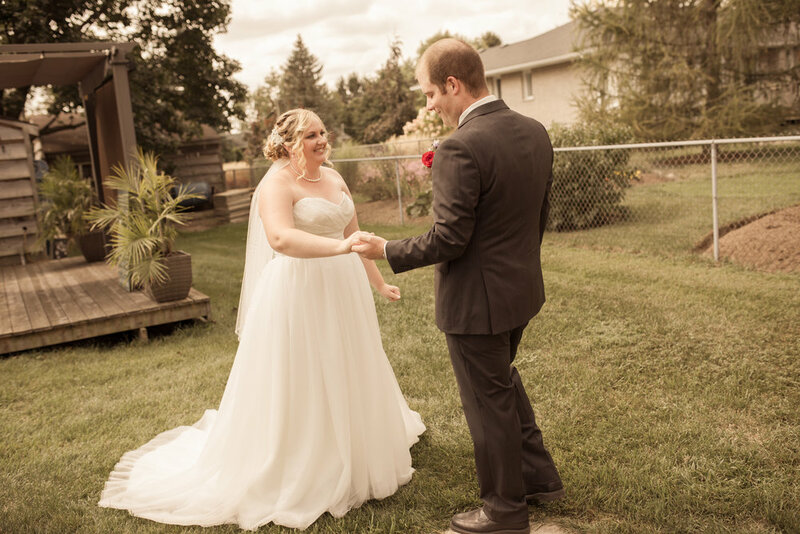 Heather, it was such a pleasure creating your Say Yes Story here at OUTW and we hope you loved reliving it through our blog. You wish you & Jamie many, many years of health, happiness & love. Thank you for choosing OUTW for your wedding gown.